Enhanced Bets Home » Bookie Offers » Coral Acca Club – Super offer worth £100! The Coral Acca Club has recently been withdrawn by Coral, if you’d like to know what it was all about our original article can be found below. For those of you new to Coral you can still make use of the Coral promo code when creating a new account there. Place one accumulator and get 5 more free! 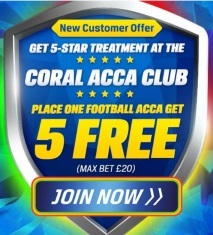 The Acca club from Coral is a fantastic promotion worth up to £100! In this article we explain how it works and how to make the most of it. What is the Coral Acca Club? Basically, it is an alternative offer for new accounts from UK bookie Coral. You join their online sportsbook and place a football accumulator as your first bet. They then give you 5 (yes, FIVE!) free accumulators to the same value. It’s flexible in terms of the stake you bet with, but at the maximum of £20, the 5 free accumulators are worth £100 in total! Sounds generous, what’s the catch? There is no catch! You just need to be aware of the rules to ensure you qualify for the offer. We have summarised these for you here so you know exactly what you need to do. 2. Place your first football accumulator bet with them within 7 days of registering the account. Again, it is important that you do this within the time frame, otherwise the offer expires. (i) Minimum of 4 teams. (ii) Minimum odds of 1/2 (or 1.5 in decimal) for each team. £20 x 7.17 = £143.40. A tidy profit if they all come in! Even if they don’t, you’ve now got 5 more free tries at similar odds. Once this initial bet is settled, you’ll be eligible to receive the 5 free accumulator bets. Note that these will be issued to your account as free bet tokens (rather than cash, so ensure you use these funds when placing the free bets). They will also be issued weekly over the first 5 weeks, so you’ll be able to use one of them every Saturday for the first month after you join up. It’s actually better this way, because it means you’ve got your pick of the long list of football matches to choose from. We’re often asked for advice on placing a winning bet, and although we don’t act as a tipster, for an offer such as this we have a few suggestions that might help while you make your choices. First and foremost, we’d suggest that you don’t be greedy! It can be oh so tempting to put a few larger priced teams into your 4 or 5-fold, but that one team is a bigger price for a reason. Yes it will come in every now and again, but you’re much more likely to win if you stick to lower priced selections. Consider a team at 3/1, what these odds are saying is essentially that they will win the game on average once in every 4 games (1 in “3+1”, i.e. 1 out of 4). To flip it round the odds would therefore suggest that they will NOT win 3 times out of 4. It might seem obvious, but there’s only one way to win, and 2 ways not to win (i.e., they lose or draw). Study the form. If you’re into your football you’ve probably got a pretty good idea which teams and players are playing well, and who’s struggling. These sort of factors will of course be considered by the bookies as well when they set the odds, but that doesn’t mean a short priced bet is a bad one. A few years back Man Utd would always be a low price at home, but that was because they won the vast majority of their games! Check for team news, injuries etc. A decent bet 2 days before the game might not be such a good call if they lose their main goalscorer in the warm up. It can pay to check the team news, check for injuries etc and place your bet in the lead up to kick off. Plus in these days of huge numbers of overseas players what about all the travel? If it’s a Saturday following an International week, your main man might have spent 20+ hours flying thousands of miles. Hardly the ideal preparation for a gruelling football match on a cold day! However you make your selections, good luck with your accas in this offer!